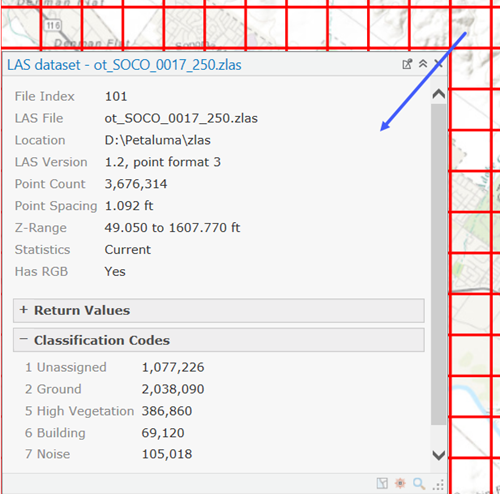 When displaying a LAS dataset layer in a map or scene, you can quickly view attribute information about a particular lidar point or LAS/ZLAS file using the Explore tool. The default pop-up window displays a formatted list of attributes when a LAS dataset is selected either as points or as a TIN surface in a map view. On the Map tab, in the Navigate group, click the Explore tool and interactively click the LAS dataset in the map view. A pop-up window appears for the selected lidar point. The location and lidar attribute information about the point display in the pop-up window. When the LAS dataset is displayed as a surface, only the slope and aspect information is displayed. For more information on pop-ups see: Pop-ups. 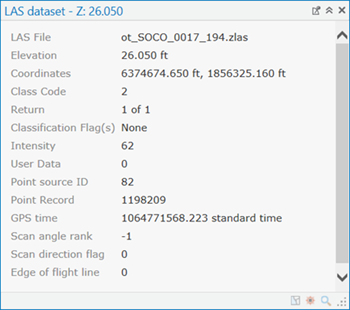 When a LAS dataset or individual LAS/ZLAS file is displayed as points in a map or scene, you can select any point using the Explore tool and the lidar point attribute information in the graphic below will appear for the selected point. If the LAS dataset is displayed as a TIN in a map or scene, you can select any location on the TIN and elevation, aspect, and slope information will populate the pop-up window for the selected location. When a LAS dataset or an individual LAS/ZLAS file is displayed using a wireframe to show file extents, you can select any file using the Explore tool, and the pop-up will display information for the selected file. The ability to view statistical information for LAS files referenced by the LAS dataset is essential to better understand the lidar data that you are working with. You can view general information in the pop-up, and then view a point count for the Return Values and Classification Codes that are available for the selected file. The ability to select the wireframe is only available in a 2D map view in ArcGIS Pro.